When CVS announced Feb. 5 that they would no longer be selling tobacco products, I was a little skeptical. Why would a billion-dollar company - that makes $1.5 billion a year in tobacco sales alone, according to USA Today - quit selling cigarettes? CVS - the nation’s second biggest drug store chain - didn’t exactly quit cigarettes cold turkey, but by October of this year they plan to halt sales of all tobacco products throughout their 7,600 pharmacies, according to latimes.com. “Ending the sale of cigarettes and tobacco products at CVS/pharmacy is the right thing for us to do for our customers and our company to help people on their path to better health," said Larry J. Merlo, President and CEO, in a CVS Caremark press release. "Put simply, the sale of tobacco products is inconsistent with our purpose." Maybe for once a company didn’t make a decision based on a gain in earnings, but rather because of peoples’ better interests? The decision puts CVS on the front line of making the United States a healthier place. Within a week of announcing their ban on tobacco, CVS Caremark company shares rose 2.3 percent, according to an article on TIME.com. So, the fact that CVS is making some money while improving the public’s health make the decision seem like a no brainer. It also seems that timing could not have been better for CVS to break the news. The question is: Are these earnings only temporary, or will they be consistently growing? 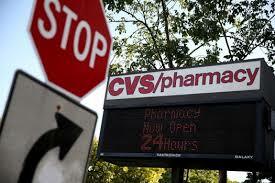 Public support of CVS’ decision from President Obama may be what is helping to increase share prices, as well. Support from Health and Human Services Secretary Kathleen Sebelius, and billionaire philanthropist - and also the former mayor of New York - Michael Bloomberg isn’t hurting either. The mass-media attention CVS has been receiving over the past week may also be a direct cause to the recent rise in company shares.